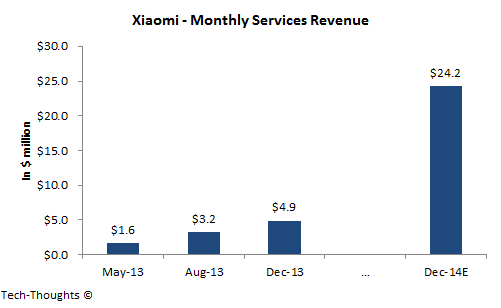 Xiaomi recently announced some 2013 statistics related to its hardware and services businesses which showed continued strong growth. Interestingly, the company is also said to be planning to launch smartphones priced at $50. Since their business model is based on monetizing engagement, this seems counter-intuitive to some observers. Wouldn't users of "bargain-basement" devices be less engaged than users of "premium" devices? The problem with this argument is that natural segmentation patterns are not based on price, but on usage. Xiaomi's "social" marketing strategy focuses on users looking for high quality devices at various price points. Their success with the $130 "Red Rice" smartphone, combined with strong growth in services revenue is a testament to that. Since most of their target audience is already engaged on social media, it isn't a stretch to assume that they will be engaged on their (cheap) devices as well. In other words, Xiaomi's strategy is to focus on the "pocketable computing" segment at all price points. This also explains their initial approach to international expansion. By focusing on markets like Hong Kong, Taiwan, Singapore and South-East Asia, Xiaomi's goal is to gain access to a similar audience. This also ensures that it is capable of offering them valuable, localized services that it can readily monetize. The impact on hardware margins in the industry is merely collateral damage.